Now that the sixth season of Game Of Thrones is over, Pokémon Go has emerged as the latest pop culture distraction to fill our lives with mashups, memes, and more. The YouTube channel Darth Blender has provided a veritable cornucopia of such jokes in a two-minute video called “Pokémon Go–Hollywood.” Set to the theme song from the Pokémon TV show, the video lets fictional characters from Frank Underwood to Indiana Jones to Bella Swan reveal their deep-seated passion for pocket monsters. Admittedly, the conceit of the video is a little fuzzy. Sometimes the characters are playing Pokémon Go on their various devices. Other times they’re interacting with Pokémon and Pokéballs in the real world. Problems with internal logical aside, the video is worth it just for the image of Tom Hanks’ Bridge Of Spies character freaking out over an Onix. 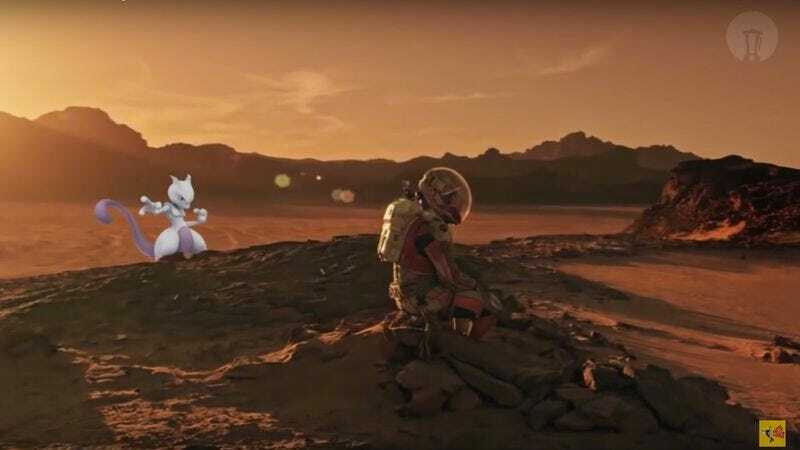 Darth Blender even suggests a possible explanation for why MewTwo hasn’t appeared in the game yet: He’s hanging out on Mars with Matt Damon.